OLATHE — Mara Hug has a clear vision of Jesus and his place in her life — even though the 12-year-old Prince of Peace parishioner is legally blind. Despite losing her sight before she turned a year old, Mara’s faith runs deep, and she often serves Mass once or twice a month. 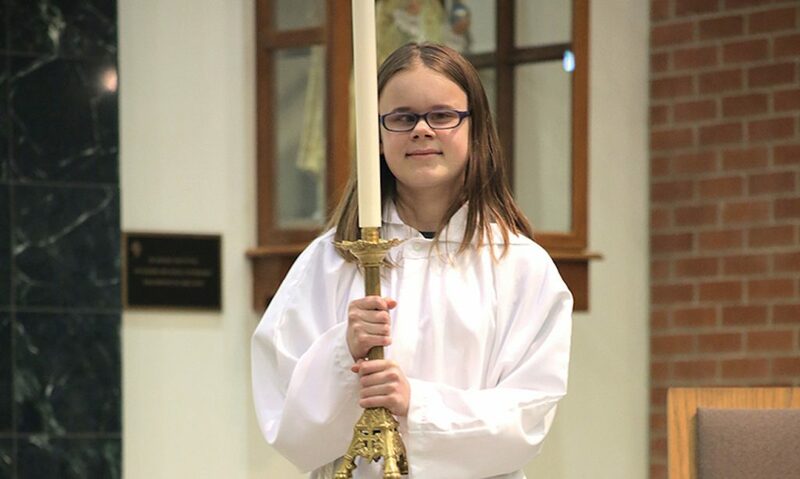 At this age, the Olathe seventh-grader, who attends Frontier Trail Middle School, serves as a candle bearer and hopes to one day carry the processional cross. Her mother Roxanne, father Joe, and brothers Alex, 17, and Johnny, 16, have watched Mara learn to navigate many new experiences in her short 12 years. And while she regularly receives support, she often relies on her own innovative thinking and keen instincts to ease the challenges of daily life. “I take pictures of things with my iPad and blow them up so I can see them,” said Mara, who can see limited shapes and dreams of being an author or an actor one day. Diagnosed with bilateral retinoblastoma, a rare form of cancer affecting the retina, when she was only three months old, Mara endured chemotherapy, radiation, cryotherapy and laser therapy all before her first birthday. Early assistance from Infant-Toddler Services of Johnson County and Kansas City-based Children’s Center for the Visually Impaired (CCVI) laid the foundation for Mara’s independence. In elementary school, Mara learned to read Braille. Much of the time, she uses a cane and carries her Braille equipment from class to class. She admits she wasn’t crazy about using Braille at first, but has learned to appreciate its advantages. “I didn’t think it was cool at first,” she said. “But now I stay up late and read in the dark,” she admitted — something even her mother couldn’t fault her for. Mara is determined not to let her visual impairment keep her from the things teens typically enjoy. She participates in choir, CYO track, tumbling and confirmation formation classwork with her sighted peers. But she spends an equal amount of time with friends she’s met through the Kansas State School for the Blind, Alphapointe and Envision. These organizations are designed to nurture friendships and build independence. To that end, she enjoys rock climbing, tubing at Snow Creek in Weston, Missouri, cooking, camps and even piloting a small aircraft with an instructor. Mara has achieved considerable academic success as well. “She has . . . managed to maintain straight A’s all through middle school so far, and has a goal to do so through 8th grade,” said Roxanne. “I’ve been trying to think of a way to sum up what I want people to know about Mara,” she continued. “She’s smart, kind and capable. She is often dismissed because of her blindness and has to work even harder to prove herself. Xavier Society provides religious materials and support to people who are blind and has helped Mara in her work at Prince of Peace. The organization treated Mara to an all-expense-paid trip to the Big Apple for the celebration. Despite her impairment, Mara came away from New York with a clear impression of the hustle and bustle of the big city.